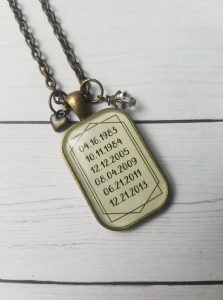 Important Dates Pendant With the ability to include up to eight specific dates, you have a TON of ways to personalize this Important Dates Pendant. In addition to birth dates, you could include anniversaries of first dates, wedding, graduation, the date of a big purchase (first home?) or any other date that holds a personal significance. The Important Dates Pendant starts at $20 and is available in 2 lengths (24″ and 30″) and your choice of antique silver or antique bronze. 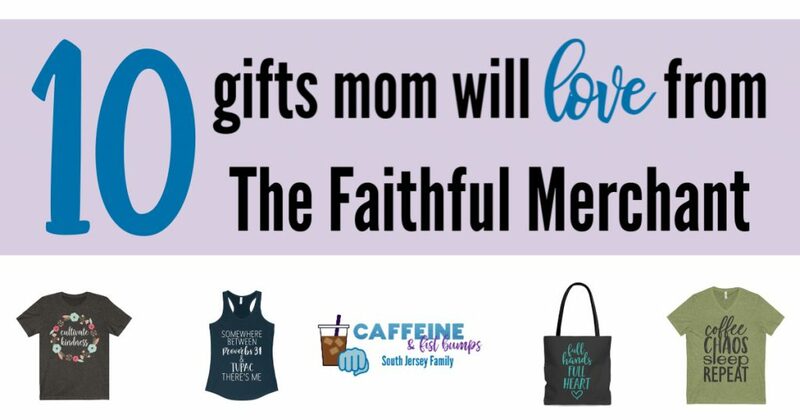 Full Hands Full Heart Tote Bag You guys, moms are forever carrying a ton of stuff with them. Toys, snacks, sippy cups, school papers…and sometimes she even remembers to bring her wallet with her (um, this was NOT me at the grocery store the other day). Give her a cute, sturdy bag to carry everything in. 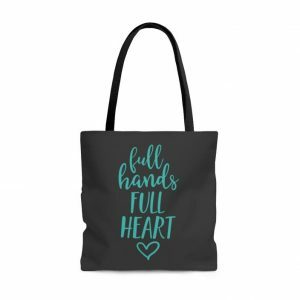 I especially love this Full Hands Full Heart Tote Bag because I feel like it helps to discourage the “wow! You’ve got your hands full!” comment that way too many of us moms hear when we’re out in public with the animals children. Yes, we’ve got our hands full, but our hearts are just as full and we wouldn’t have it any other way. This tote bag is available in 3 different sizes of (stain-camouflaging) black and starts at $18. Cultivate Kindness Unisex Tee Is it just me or are people not as nice as they should be?! 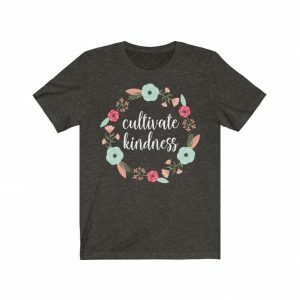 When she’s wearing her “cultivate kindness” tee, she’ll be encouraging others to do the same…which means Mama Bear should make fewer appearances. Let’s all just get along! This tee is probably the softest tee that she’ll ever wear. It’s $24 and available in unisex sizes XS-3X in this “goes with everything” black heather color. The Faithful Merchant has even included a handy measurement chart so you can make sure you’re ordering the correct size. 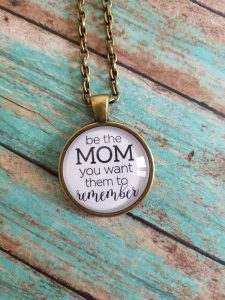 Be The Mom You Want Them To Remember Pendant This is something that I struggle with, so I’m just assuming that other moms do as well. We’re always comparing ourselves to others and drive ourselves batty trying to make lives pinterest-perfect for our families that we sometimes forget that our kids just want us to be who we are: awesome moms. A store-bought birthday cake is just as one a mom would spend hours baking and decorating – our kids will remember the love and attention that we show them. They’ll remember the big picture more than the tiny little details that we often fret over. This pendant starts at $20 and is available in 5 different shapes, 2 different metal tones (antique bronze & antique silver), and 2 different lengths (24″ and 30″). 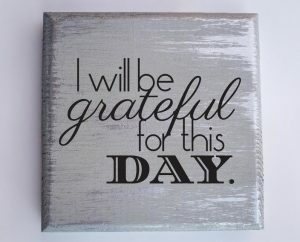 I Will Be Grateful For This Day Quote Block I’m always on the lookout for new home decor. This quote block is super reasonable at $18 (!!) and adds a little extra something something to the decor. Mine is currently a part of a family photo display on the wall going upstairs. This quote comes in handy on those crazy days when we just need to remember that we get each day of our lives only once and to make the most of each day. This quote block measures 5″x5″ and is available in gray/silver and ivory/gold, so it can coordinate with any home. 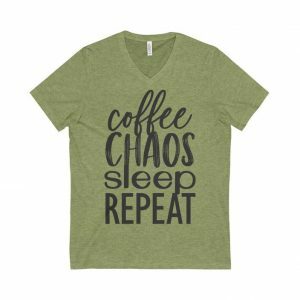 Coffee Chaos Sleep Repeat Unisex v-neck Tee Coffee, Chaos, Sleep, Repeat is a pretty accurate description of how my days go! Graphic tees are my go-to tops in my closet – they match black leggings perfectly and are comfy, but still easy to dress up with some jewelry. I love this tee because it almost guarantees that it’ll start a conversation with another mom! Available in 3 colors and unisex sizes XS-3x, this $24 tee is perfect for any busy mom. 2″ Skinny Rectangle Blessed Mama Pendant I have a few pendants in this shape/size and, let me tell you, they’re perfection! I love to layer mine with other necklaces of mine for a unique look. If you’re not a fan of the “blessed mama” print, The Faithful Merchant offers custom designs here. This sweet pendant starts at $22, is available in antique bronze and antique silver, and available with 24″ and 30″ chains. 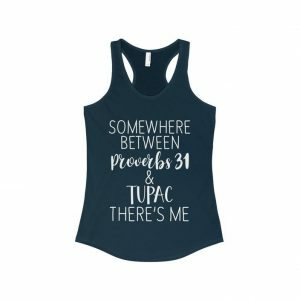 Proverbs 31 & Tupac Racerback Tank Whether she’s chasing after the kids or getting her run on at the gym, this racerback tank is super relatable and, in many cases, so true! This tank is $22, available in 3 colors (I’m loving the Solid Midnight Navy as pictured), and available in sizes XS-2x. Sizing up is recommended if Mom would like a relaxed fit. (There’s also a tee and a sweatshirt if that’s more her thing! 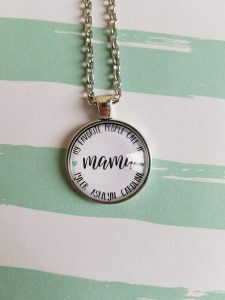 My Favorite People Call Me Mama Pendant Necklace I love love love LOVE that The Faithful Merchant offers custom jewelry. 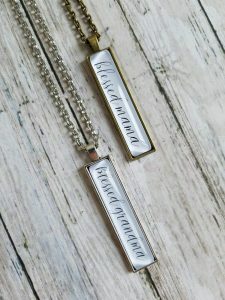 This pendant can fit up to 3 names (if you need to include more than 3 names, check out this Custom Blessed Mama Pendant), is available in antique silver and antique bronze in 24″ and 30″ chain lengths starting at $20. You guys, that is a STEAL for custom jewelry. 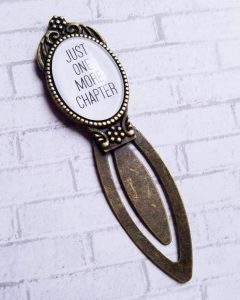 Now, if you’ve read this far, you deserve something special! Since I can’t deliver cookies through this article, how about a coupon code! When you shop with The Faithful Merchant, you can get one pendant necklace for free when you buy three with the code BUY3GET1. Score!! Might as well pick up a few for the grandmothers in your life, too, right? Next story South Jersey: We’re changing our name!